In 1985, the formation of the group, Bass Desires, was one of the most exciting new developments in contemporary jazz. Bassist/composer Marc Johnson has selected three sympathetic collaborators to create some of today's most refreshing and satisfying music--both on record and in live performance. 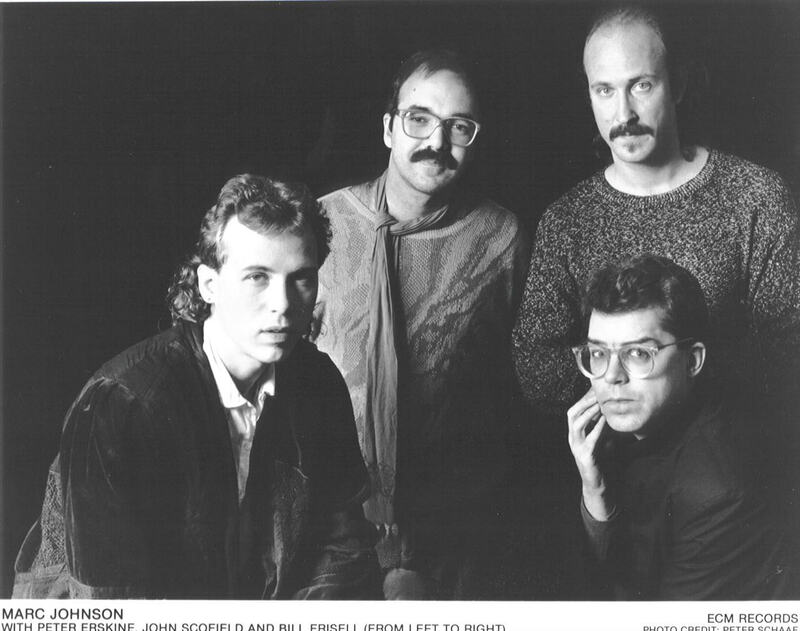 Their first recording, Bass Desires, finds Johnson with two guitarists possessing contrasting styles, John Scofield and Bill Frisell. The result is a full and often raucous sound underpinned by Peter Erskine's catalytic and highly musical drum foundation. Aside from Johnson's warm and rich tone on bass, one of his major contributions as the group leader is his impeccable selection of material. His own composing abilities are represented by the album-opening "Samurai Hee-Haw"--a witty and inventive rocker with both country and oriental allusions--as well as his lilting reggae piece "Mojo Highway." Johnson has also chosen John Coltrane's "Resolution" (from A Love Supreme) for an extended, energy-packed quartet treatment. The traditional "Black is the Color of my true love's hair" is performed as a duo ballad by Johnson and Frisell. John Scofield, known for his linear blues and bop lines with a contemporary twist on guitar, contributes a slow blues, "Thanks Again." Drummer Peter Erskine brought the title tune to the sessions which spurred a spirited, free-bop rendition from the group. Bernstien and David's "A Wishing Doll" is also performed by the quartet. Individually, the group member's backgrounds and credits in the jazz community are impressive, to say the least. Currently the bassist in Jhn Abercrombie's group, Marc Johnson also spent two years with the late Bill Evans in what turned out to be his final working trio.Marc also recently recorded with Lyle Mays. He has worked with Stan Getz, Woody Herman, Toots Thielemans, John Lewis, Joanne Brackeen, Philly Joe Jones and Bob Brookmeyer. Johnson's own bass style has developed out of the tradition of the late Scott LaFaro into a language that is adaptive and flexible, yet truly his own. John Scofield most recently has gained wide recognition as a member of Miles Davis' group. Long before this association, however, John had developed a reputation as an original atylist and group leader with a devoted follwing. He has worked with Charles Mingus, Gary Burton, John Abercrombie, Billy Cobham/George Duke, Jay McShann, Larry Coryell, Ron Carter, Lee Konitz and Tony Williams, to name a few. Scofield's trio with Steve Swallow and Adam Nussbaum broadened his reputation as a group leader and recording artist with wide exposure in both Europe and the U.S. His current group has taken on a more funky and fusion-oriented approch as his singular guitar style has developed to a level which reflects the work of an artist in his prime. Emerging as the most original and sought-after guitar and guitar synthesizer voice of the last five years, Bill Frisell is featured in a number of today's most provocative settings. Besides his current membership in the Paul Motion Trio and Julius Hemphill's JAH Band, his past associsations include work with both Jan Garbarek and Eberhard Weber. He has recently recorded projects with Paul Bley, Lyle Mays, Tim Berne, Vernon Reid, and Henry Kaiser. Chip Stern in Musician perhaps described Bill's conception best: "Frisell's electric guitar style is modern in the best sense of that word, straddling the electronic ambience and distortion of contemporary rock and the nuances of touch and harmonic sophistication usally associated with jazz." Drummer Peter Erskine is best known for his work with Joe Zawinul and Wayne Shorter in Weather Report, as well as his current work in Steps Ahead (with Michael Brecker and Mike Manieri). In addition to his work with Bass Desires he is a member of John Abercrombies Trio. His versatility is commonly acknowledged, but Erskine's ability to bring his own identity to such diverse and demanding musical situations is truly remarkable. Certainly one of today's busiest drummers, Peter manages to select only the most challenging and rewarding settings to play in.